Carlene Carter On Mountain Stage Carlene Carter, daughter of June Carter, recently released her first new album in 12 years. In a special appearance in the border city of Bristol, Tenn./Va., where past generations of her family recorded country music, Carter performs selections from her new album for Mountain Stage..
Carlene Carter performed on Mountain Stage. 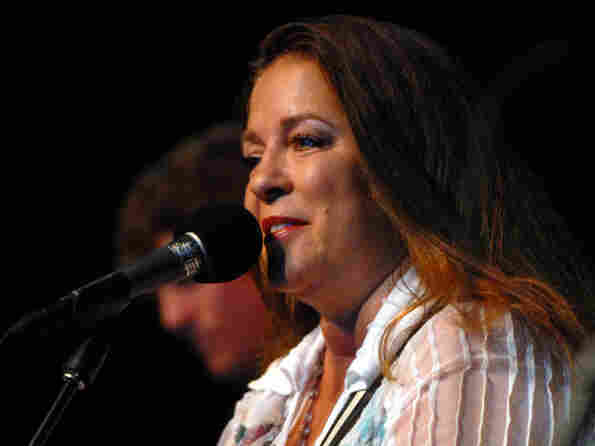 Country singer and songwriter Carlene Carter is a third-generation member of country music's First Family. The Carters were extraordinarily prolific: Carlene's grandmother, "Mother" Maybelle Carter, along with A.P. and Sara Carter, cut some of the first commercially successful country music in the border town of Bristol, Tenn./Va., back in 1927. "Me and the Wildwood Rose"
Those landmark sessions -- and Bristol's rich history -- are now preserved by the non-profit group The Birthplace of Country Music Alliance, which invited Mountain Stage to record in Bristol for a third consecutive year. The daughter of June Carter and her first husband, rockabilly singer Carl Smith, Carlene Carter is heard here in a special appearance in the historic border city, where she performs selections from her first new record in 12 years, Stronger. This segment originally ran Oct. 13, 2008.